Contrary to the opinions voiced by some of our European neighbours, the British have bequeathed a fine legacy of culinary delights to the world. The list is long but I could single out Toad-in-the-Hole, Faggots & Peas, Roast Beef & Yorkshire Pudding, Bangers & Mash and, of course, Fish & Chips. These are all substantial, hearty dishes, suited to a long day toiling behind a horse and plough or sat in front of a couple of LCD screens. They are not for wimps and health freaks. For them someone invented salad. When I was a kid, aged about nine or ten, my treat on a Saturday was to travel by train from Cirencester to Swindon Junction, two carriages and a small, decrepit steam locomotive providing the means of motion. I'd spend all day on the station platform, writing down the numbers of every engine that passed and thrilling to the sight of the express trains, trains with names like The Red Dragon or The Bristolian, as they thundered through the station, whistles dopplering away. 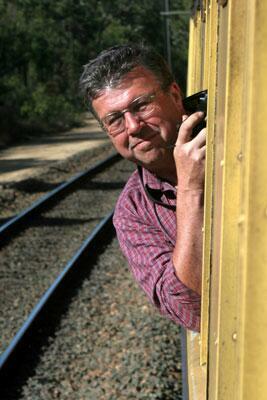 I didn't psychoanalyse myself to discover why I had this compulsion to collect locomotive numbers; I was a small boy. That was what small boys did in the 1950s if sports or girls hadn’t seduced them. My mum packed my lunch. This would consist, in all probability, of cheese and HP sauce sandwiches and a Lyons Individual Fruit Pie, apple flavour. These pies were marvellous inventions - a lovely sweet, short pastry enclosing the thinnest imaginable filling of apple puree. Nothing in them was good for you and so they were ideal for preparing the body for a lifetime of excess. To drink I was provided with a bottle of Tizer, a sugary, fizzy drink, doubtless produced in cooperation with the School Dental Service as a means of promoting attendance at the surgery and some character building pain and suffering. After eight or nine hours I caught the train back to Ciren. With luck I would have threepence left with which to buy my supper on the way home. This treat would set the seal on a perfect day. 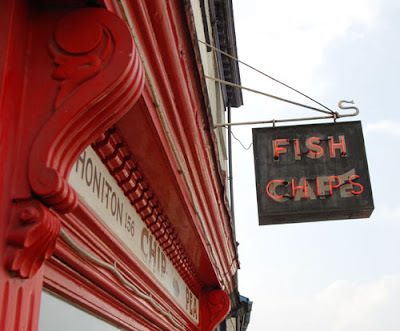 It consisted of a pile of chips (or fries, if you must), cooked in animal fat, not namby-pamby vegetable oil, served in a square of grease-proof paper and then wrapped in a sheet or two ripped from the local news journal. The concept of washing my hands before eating was not within my grasp then and anyway there would have been nowhere to do it. So I ate this delicious offering with fingers blackened by a day spent with grimy railway engines. Each chip came with a layer of grease, salt, vinegar, printer's ink and soot. They were absolutely magical, a flavour sensation as yet unbeaten by the cuisine of any other nationality. Back in the nineteenth century, when embellishment was not a word primarily associated with plastic surgery or body piercing, the Victorians applied it to their edifices with aplomb. 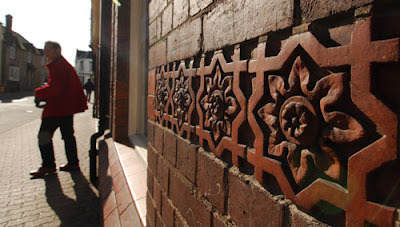 This beautiful motif on a building in Tenbury Wells serves no other purpose than to lift some mundane English bond brickwork into a higher plane. Lifting the image into a higher plane is my friend Peter, fulfilling the role of photographer's stooge. On this occasion he is performing under his own steam and without direction, giving us his celebrated portrayal of 'Man about to leave frame'. Half a second later, he was gone. Sometimes I realise that my purpose on earth is not only to serve as a warning to others but also to keep them amused. 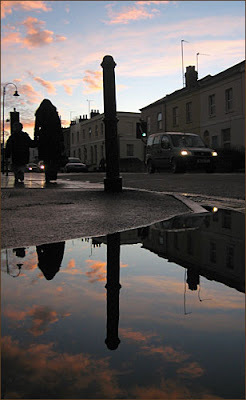 I imagine that the majority of adults would pass by a large puddle without giving it another thought. For me that would be impossible. There's the whole sunset thing going on in the sky, a mother and child in the distance and passing traffic. Just the recipe for some cavorting about in the middle of the road with my little Canon and some strange looks. I like photographing scenes from near ground level but I don't like the effort involved in getting down there and back up again. A few years ago I bought myself a monopod in the hope of steadying long lens shots in poor light conditions. I didn't find it very effective but now I'd like to start using it the other way up so that I can get the camera near the ground while staying with my head in the clouds; just add a cable release. The problem is that I've put the thing somewhere safe and that's as good as throwing it out. I've given up hiding things away when we go on holiday because I know that's the last I'll ever see of them. It's not as if we live in a mansion, something with forty bedrooms and a light-fingered butler. There are just not enough nooks and crannies in our house to secrete away a three-foot long silver-grey pole. Yet it's gone, vanished, present no more. It's been hustled away to the great repository of all lost things, to spend its declining years hidden in a forest of umbrellas, biros, tiny screws and opportunities. Now I could go out and buy a new monopod at great expense but, as we all know, as soon as I do, the old one will leap out from under a work bench or from behind the sofa with a jubilant cry of 'here I am, you old fool'. And I will be forced to rend it asunder with a large hammer and a sharp saw. A couple of days ago, Gargoyle reprimanded me for not showing the leeks that went with the crate image. 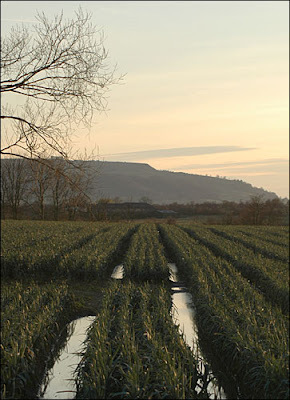 So here they are, romantically bathed in the late evening sun, the pastel-tinged sky silhouetting Bredon Hill in the distance and the undisturbed pools of rainwater in the ditch reflecting the tranquillity above. Or some such nonsense. Talking of romantically bathed in light, if you were ever under the impression that the television cameraman's lot was all beer and donuts, think again. Away from the frozen wastes of the racetrack, the baying crowds of the football stadium or the windy expanses of the golf course, the usual habitat of these sports specialists, life is still a struggle. Even in the relative comfort of the studio, it can get a bit parky around the nether regions and these intrepid men of vision gather around a blazing fire, awaiting the call of the wild. Or, more accurately, the plaintive call of the floor manager- 'Cameramen on cans, please'. I did a flea market with Pixie last Sunday and I can assure you that spending the day inside a large shed is not my idea of heaven. Particularly a shed normally used to show sheep. (Show sheep what, I hear you ask? – sorry, can’t tell you). Actually I'm not sure what my idea of heaven is – probably something including chocolate, marzipan, sunny days, Penelope Cruz, real pork sausages – you get the picture. But I doubt it includes a shed. Now doubtless you are eager to know what's in my shed - yes you are. Don't deny it! First of all I must point out that mine is not a retreat - since I have pretensions to being a bit posh, I have a study for that. While there is an easy chair in the shed, it is only over-wintering, awaiting its opportunity to deteriorate gently on the decking throughout the summer. Other than the chair there's a petrol mower along with several cans containing substances which may or may not be petrol - I test these by giving the contents a good sniff before use. Always good for either a high or a headache. There's a selection of gardening tools. Many of them were bought at small country auctions and I've no idea what their function is but they look pretty. I'm still short of a good dibber which is not a big problem as I've virtually given up dibbing. There's a pristine axe, bought for me after a visit by my late friend Paul who couldn't imagine a house without one; we got rid of the open fire about a month later. Many people have photos to remember someone by; I've got an unblunt instrument. An old bookcase carries an assortment of hosepipe attachments that fit no known system, cans and bottles of liquids that will remove the skin from your hand or the lining from your stomach but leave a small insignificant black or green flying insect totally unharmed. Stuck away somewhere is the length of tube that I use to empty the fountain once a year and without which I would be lost. On the back of the door are all the labels from the plants I’ve bought over the years, most of which have now died – a poignant in-memoriam section. So sheds, care for one today – you know it makes sense. Now if you’re expecting a picture of a shed, you're going to be disappointed. 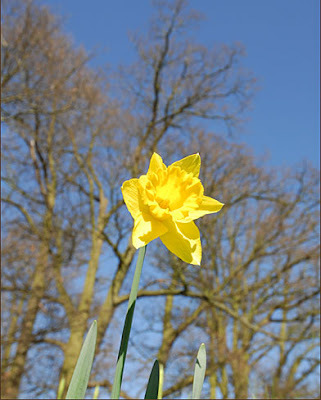 Instead, here’s a daffodil. Played the bodhran this evening for the first time in months. Good exercise but tough on the wrist. Can’t help thinking that if I persist, I’ll end up with my right arm three times the size of the left – I suppose drinking lager in steins would have the same effect only that would be less noisy in its execution. I’ve been keen on Irish pipe and fiddle music since my early twenties, listening to bands such as Planxty and the Boys of the Lough. Their music must resonate with some particular part of my brain. Or is it that I just like something to tap my feet to? The day was not too exciting on the image making front although the light was excellent early on. I knocked off a few pictures of a pile of vegetable crates in a field as I cycled in to work. As Penelope Cruz didn’t appear in the Pershore area at any point yet again, I had to be content with getting a very muddy foot while trying for the perfect photograph of an abandoned shopping trolley – well you have to push yourself for your art, don’t you? 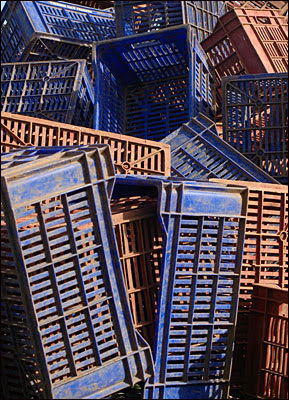 So an exciting image of a pile of crates. They are dumped in a field planted with leeks. It really makes no difference what vegetable they plant around here; it could equally have been sprouts or cabbage. They all smell revolting and, in general, taste very much like they smell. Harking back to a recent post, today's discussion with Pixie over breakfast was about strappy sandals - enough said? Cheltenham Festival this week, a horse-racing event which causes chaos on the roads and, in a good year, jubilation in the shops and hotels. The area is invaded by the sort of men that you wouldn't want your daughter to marry and the sort of women for whom spending obscene amounts of money gives meaning to their lives. Most locals don't care as long as they get their cut but for those not involved, like me, the whole business is very tiresome (as my Great Aunt Lil would have said). Any journey to the south requires a wide-sweeping detour through the Cotswolds, swinging out in a great arc to the east in order to avoid the sclerotic heart of Gloucestershire. This detour across the hills took us to Stow-on-the-Wold for coffee and a croissant (awfully posh round there - no buns). It's a bit of an arty place, rather too well littered with Hooray Henrys and dismally infested with Londoners with money to spend. But on a good day, like today, the town manages to rise above these impediments. Then to Cirencester, across country on the Fosse Way, an ancient Roman road which still manages, in principle, to get from A to B without deviating to C, D, or E. The Romans didn't feel the need to serve every single British settlement they came across; the roads were there to get troops and supplies from one place to the next as quickly as possible. (For an example of the opposite approach, try a number 540 bus between Cheltenham and Evesham). Cirencester was its usual self, its pretensions countered by the large number of chain store shops. Like many other small towns, the main street could be anywhere -no individuality, nothing to make it any more interesting to shop in than similar neighbours like Evesham, Tewkesbury or Stroud. It is only in small towns, often more like large villages, places like Stow, Pershore, Tetbury, Burford or Lechlade, that you come across shops that possess any sort of originality. And these are constantly under threat from the great malevolent force of British retailing -Tesco's. Hardly a week goes by without some poor benighted community being forced to rise up in order to resist the rapacious demands of this grotesque behemoth. Unfortunately, as is so often the way, a word or two in the right ears and no doubt the odd sweetener smoothes the path through the planning process and, lo and behold, another symbiosis of retailer and consumer bites the dust. 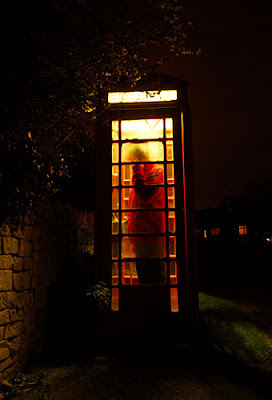 On the way down to the pub last night I had a sudden craving to photograph a telephone box at night. Every ready to oblige, Peter nipped inside this traditional symbol of British communication to do a bit of posing with a handset. That's what mates are for. OK, I'm back, after a fashion. I had a working trip to the Bahamas a few weeks ago. It was warm, sunny and the most frustrating place I've worked in thirty nine years in broadcasting. I'll say no more about the business aspect. The hotel in which we were based was styled in a gross interpretation of an ancient legend, a cacophony in concrete, polystyrene and glass fibre. Luckily I wasn't paying to be there and it is perhaps an indication of the level of sophistication of the food offered that it was exceeded by that in the nearby Starbucks. I will say, in an effort to redress the balance somewhat, that my room was excellent. If I'd been a ten-year old child with a father with bottomless pockets, I'd have been reasonably well-served. Or an inveterate gambler anxious to dispose of my wealth. So a good whinge, then, just to re-establish the genre. I like working at Maidstone Studios; easy to get to you, easy to park, easy people to work with. Niki and Tracy kept me company in Lighting Control on this occasion, making sure our punters looked spick and span in all respects. During our far-ranging discussions on life, the universe and everything, it became obvious that my feminine side has been creeping up on me recently. I'll not go into detail but I reckon I know more than I need to about some subjects not normally in the masculine purlieu. I know what's caused this shift in my view of life. It's books. I've been reading too many female authors. I'm sorry, ladies, but you're corrupting me. Only today, out for a walk with Pixie, I was looking for some fluffy gambolling lambs to photograph. Over breakfast I was criticising the dress-sense of the so-called celebrities in Pixie's 'Instyle' magazine. And I'm already suffering from an unhealthy interest in soft furnishings. I suppose the cure will be a dose of Clive Cussler, Jack Higgins or Robert Ludlum. Unfortunately it will have to wait until I've demolished the mountain of volumes I've got by Rose Tremain, Isabelle Allende and Anita Shreve. So something twee for a picture? No, I don't think so. 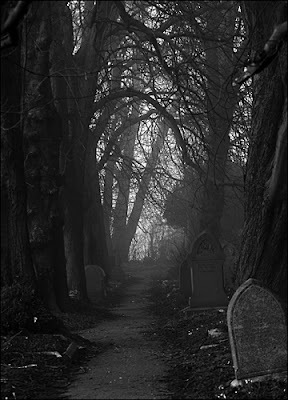 How about a dim and spooky path through a grove of trees? Much more Stephen King, much less Katie Fforde. A few months have passed since my last post - my, doesn't that sounds like something from a confessional. I've been working a bit harder than usual recently, including another trip to Maidstone, several more days in the bunker in east London and a flight to the warmth of the Bahamas for a seven-day shoot in January. Despite that I've still had plenty of time for blogging and what have I written - nothing. I have no excuse. Image wise I've been fairly active with a number of pictures uploaded to Istock, some of which are selling. I shoot in an essentially people-free style by choice, only using those irritating and uncontrollable specimens of humanity to give the pictures scale. From the point of view of sales, this makes many of my pictures less desirable although a person-free image of the Boston City skyline was on 89 downloads this morning and counting . I'm not sure I'll change this approach; I shoot pictures for my own pleasure and the ego-trip I get every time one is downloaded. Strangely enough the money isn't really a consideration and since some of the smaller images sell at 25c a time, it's not likely to become so. 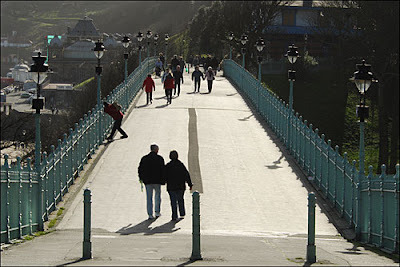 Scarborough is a long-established seaside resort on the Yorkshire coast, overlooking the North Sea. It's a place of contrasts with an unpleasant, 'kiss-me-quick' area down by the harbour set against the elegant splendour of days-gone-by up on the cliffs near the Winter Gardens. For those of you who can remember my past themes, there's a group of three and some splashes of red; one splash belongs to my friend Peter whose rear end can be seen protruding out on the left hand side of the bridge. I'm getting too old and cranky for that sort of pose so most of my pictures are taken from eye-height, which is about 6' up from the ground in my case. Well I've no idea when the next post will come so please don't hold your breath.